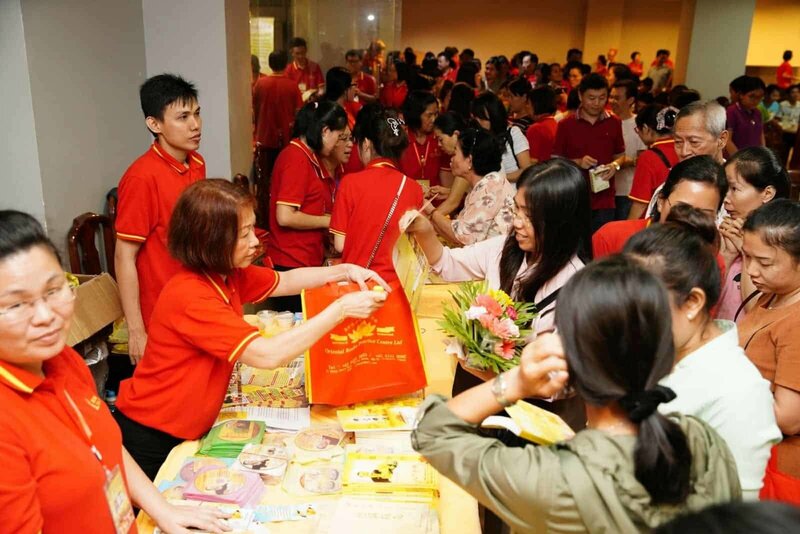 With the guidance of the world-renowned Buddhist Master Jun Hong Lu, Guan Yin Citta Buddhist Practice organization held a successful Free Vegetarian Tasting Event in Cambodia’s capital, Phnom Penh on September 22, 2018. More than 500 people from local communities and neighborhoods attended this event, which provoked people’s interest in learning Buddhism and adapting to a vegetarian lifestyle. As a predominantly Buddhist nation, Cambodia has a sizeable Buddhist community: Over 97% of the country’s population believes in Buddhism. Nearly 90 Buddhist practitioners from around the world travelled all the way to Phnom Penh and participated in the series of Dharma propagation activities. They not only distributed flyers and Buddhist learning materials on streets, but also released fish and tortoises in rivers, as a popular Buddhist practice of cultivating compassion. As the climax of these activities, the Free Vegetarian Tasting Event caused a sensation in local Chinese communities. More than 500 people attended the event and the venue was fully packed. The program began with Buddhist songs performed by Guan Yin Citta volunteers. The beautiful melody created an atmosphere of joy and serenity. In the video sharing session, the guests and Buddhist friends watched clips from Master Jun Hong Lu’s Dharma Talks and Totem Readings. In spite of the barrier of language, participants showed great interests in Master Jun Hong Lu’s Buddhist teachings and fascinated by the wisdom of Buddhism. In addition to the Dharma Talk, the heartfelt Totem Reading sessions deeply resonated with many of the guests. They were shocked to see that so many people suffering in despair. From other people’s stories, many guests realized the law of karma is true, and indeed, we have to be responsible for our own actions. The Free Vegetarian Tasting Event was a great success. In the near future, there will be more free vegetarian events organized in Cambodia by Guan Yin Citta to promote Master Jun Hong Lu’s Buddhist teachings. Guan Yin Citta Dharma Door shall blossom in this beautiful land, bringing happiness and inner peace to more people!